Somervell County provides for curbside voting at early voting and election day polling locations. Please notify the election workers either by calling ahead or sending in an assistant to the polling place. All polling places used by the Somervell County Elections Office are handicapped accessible. Each polling location also has available magnifying sheets and wheelchair accessible voting machines. Additionally, persons unable to read or write may bring an assistant of their choice to help with the voting process. Voters’ union representatives and employers are ineligible to assist. Election workers are also available to assist upon request. Disabled voters, those over 65 years of age, and voters who expect to be out of the county during both the early voting period and election day may request a ballot be mailed to them. 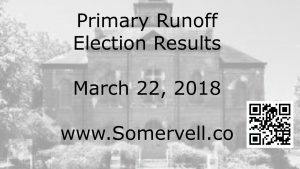 Applications for a Ballot By Mail are available from the Somervell County Elections Office. Click Ballot By Mail or the Secretary of State for more information.